To say it's been an eventful start to the new year is quite the understatement. As I've chronicled in the market updates, there is every indication that 2016 is a different from recent years. There is greater volatility, and oversold levels that had led to bounces in the recent past have not been able to find buyers. With the increased directional movement and potential opportunity set, you would think this would be a wonderful psychological environment for traders. Oddly, however, I've been hearing more about fatigue and frustration than fortune and fulfillment. 1) Slowness to Adapt - I heard it at $50 and I heard it at $40 and I'm hearing it with the break of $30: oil prices are going to rebound. I've also heard quite a bit of "We're overdue for a bounce." Just recently, the Fed deemed the economy to be sufficiently robust to raise interest rates. How could we now be crashing? Staying grounded in old perceptions and not updating with fresh observations of what is actually happening has kept many traders from profiting from the risk-off of early 2016. Traders have also been slow to adapt to the increased volatility, placing stops too close and taking profits too early. This creates a psychological environment ripe for frustration and negative self-talk. 2) Fatigue - There is meaningful--and different--market movement in Asian, European, and U.S. time zones. Many traders have attempted to track and trade markets through the 24-hour day and that has been both stressful and tiring. I've noticed much more checking of prices via phone during non-trading hours, as traders holding positions feel a need to be switched on to developments overseas and overnight. With the fatigue comes diminished concentration and the potential for impulsive decision-making. With fatigue, as well, it becomes more difficult to hold frustration at bay when losing money or missing a trade. The bottom line is that when markets are moving more than usual and moving in all time zones, you are going to leave a boatload of money on the table. You're not going to catch every move, and it's going to hurt when you get a trade wrong. If you treat all movement as opportunity, you're going to chronically feel frustrated, as there will always be profits you failed to earn. 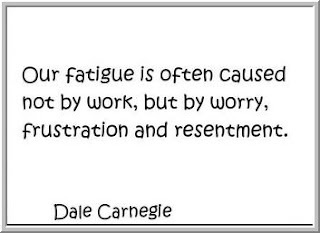 So much of our fatigue is not simply a function of lack of sleep, but the result of negative self-talk that comes from frustration. I spent a very enjoyable day on the trading floor at SMB this past week, talking with the traders and doing my own trading. I placed two trades all day: made money on an early selloff in the morning and made money on a rise in the afternoon. Did I make money in the overnight trade? Nope; didn't trade it. Did I make money on the initial sharp move higher from the midday lows? Nope; didn't trade it. Did I trade in size? Nope; I target a set level of daily P&L volatility so that I trade smaller when markets become more volatile. So how should I feel at the end of the day? From one perspective, I left a ton of money on the table. From another perspective, I traded the patterns that I research, I made money, and I had a great day talking with traders who have grown tremendously and who are doing interesting and profitable things in the market. At the end of the day, it's important to know the game that you're playing; accept the games that you're not playing; and find peace with who you are, what you can do, and what you can't do. Only some market movement is opportunity: that sphere of movement that overlaps where we truly possess an edge. BMW doesn't fret over buyers who choose to drive a Chevy; that's not the game they're playing. The people who run Silversea cruises don't bang their heads against walls because they "left money on the table" when people chose Disney cruises. You judge yourself against your own yardstick, against the metrics that capture who you are and what you're trying to accomplish. Trading can be fun and we can be passionate about markets, but nothing is so important that it should dictate and control our physical and emotional well-being. Trading has to fit into our lives and skill sets; otherwise, our relationship with markets becomes an unhappy and even abusive one.